The Ticks Have Arrived. Protect Yourself This Summer! > Blog > Uncategorized > The Ticks Have Arrived. Protect Yourself This Summer! Ticks are out in full force across the country including right here in Regina. Ticks pose a threat to your health and safety because of their potential to carry Lyme Disease. Lyme disease can appear quickly or gradually with symptoms that can come and go. Most commonly the first signs of Lyme, consist of a sore throat, headaches, congestion and other flu-like symptoms. The symptoms of Lyme can range from mild to fatal so the best protection is prevention. Take note of these 5 tips to keep yourself and your family safe this summer. Purchase your repellent in bulk this year because you’re going to need it. Be sure to spray all your exposed skin with just enough to cover yourself. For your kids, spray repellent on your hands and wipe it onto their skin. Be sure to avoid children’s hands, eyes and mouths. When using repellent, it’s essential to bathe or shower before bed to remove any remnants of repellent. When you’re walking through wooded or grassy areas, cover up with light-coloured clothes to make it easier to spot ticks. Wear long sleeves and pants with socks and closed toed shoes as often as possible. Tucking your hair into your hat, shirt into your pants and pants into your socks will keep your skin covered reducing your risk. When you arrive home, put your clothes through the dryer on high heat to kill any ticks that may be attached. Shower as soon as possible to remove any unattached ticks that could be present on your body but not attached. Ticks can catch a ride on you but remain unattached for hours. Check your entire body carefully including your armpits, groin, in and around your ears, in your belly button, behind your knees, and in your hair. Should you find a tick, be sure to remove the entire insect including the head. Tall grass and lots of shade make the perfect home for ticks. Keep your lawn mowed, and remove any debris to discourage ticks from moving into your yard. Protect your yard from deer and other large animals as they are common carries for ticks. Ticks find pets a convenient source of transportation. Be sure to check your pets thoroughly as ticks can travel from your pets to you. Check under the collar, under the front legs, at the elbow, between the toes, inside the groin area, and under the tail on your pets for the presence of ticks. 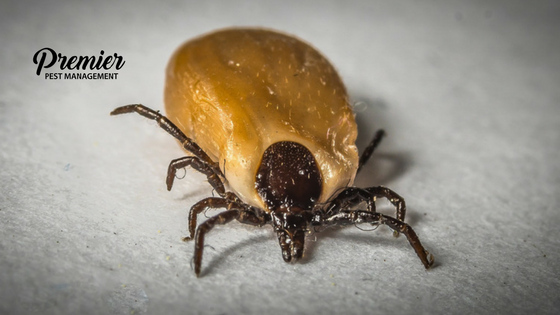 To keep yourself safe from and free of ticks this year, give Premier Pest Management a call!